amplifier whose output voltage is proportional to the negative of its input voltage and that boosts the amplitude of an input signal many times, i.e., has a very high gain. It is usually connected so that part of the output is fed back to the input. in electronics and electrical engineering, a device used to amplify electrical or electromagnetic oscillations in multichannel communication systems and in radio-receiving, radio-transmitting, measuring, and other apparatus. Such amplification consists in the control, through some active element, of the amplifier power supply by the signal being amplified. Most often the active element is a transistor, a vacuum tube, a tunnel diode, a parametric diode, a voltage-variable capacitor, or an inductance coil with a core made of a ferromagnetic material. It is characteristic of an amplifier that the controlled power P0 of the power supply is considerably greater than the controlling, or input, power P1 of the signal source (Figure 1). The output power P2 is the part of P0 that is supplied to the external circuit, or load. In contrast to a passive circuit (such as a transformer), which does not contain a power source, an amplifier has a power amplification, or power gain, Kp = P2/P1 that is greater than unity. In addition to the amplification of power, amplifiers can increase the voltage and current of the signal source. The voltage increase is measured by the voltage amplification, or voltage gain, KU = U2/U1: the current increase is measured by the current amplification KI = I2/I1. Here. U1 and I1 are the voltage and current, respectively, at the amplifier input, and U2 and I2 are the voltage and current at the amplifier output. Figure 2. Schematic diagrams of bipolar and field-effect transistor amplifiers: (I) common-emitter amplifier, (II) common-source amplifier, (III) common-base amplifier, (IV) common-gate amplifier; (E), (C), and (B) emitter, collector, and base of bipolar transistor; (S), (G), and (D) source, gate, and drain of field-effect transistor; (er) source of amplified oscillations; (RF) and (RL) equivalent resistances of input circuit and load; (Ebe), (Ece), (Egs) and (Eds) DC sources in base-emitter, collector-emitter, gate-source, and drain-source circuits. The designation of the amplifier type is determined by the transistor region (electrode) that is common to both the load circuit and the circuit of the source of the amplified signal. frequencies and amplitudes. 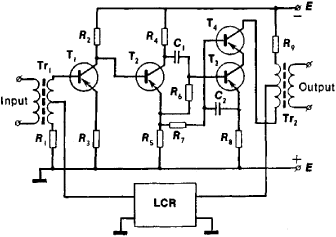 In general, amplifiers are used to increase the level of various kinds of signals. This increase is measured primarily by the quantity KP. The simplest amplifiers use only one active element. If the required KP is greater than the value that can be provided by such amplifiers, a more complex, cascaded type is used, which consists of two or more amplifier stages. Classification. The following types of amplifiers can be distinguished on the basis of the type of active element used: transistor amplifiers, vacuum-tube amplifiers, diode regenerative amplifiers, parametric amplifiers, dielectric amplifiers, magnetic amplifiers, klystron and traveling-wave amplifiers, and maser amplifiers. Amplifiers using bipolar or field-effect transistors can be divided into three types according to the transistor terminal that is common to both the input and output circuits of the amplifier. The common terminal may be the emitter or source (Figure 2,1 and II), the base or gate (Figure 2,111 and IV), or the collector or drain (seeFOLLOWER, Figure 1). In amplifiers using bipolar transistors the presence of input current means that a certain amount of power must be expended to control the transistor. This disadvantage is less pronounced in common-emitter amplifiers, whose input impedance is relatively high and can reach several kilohms, and is more pronounced in common-base amplifiers, which have an input impedance of tens of ohms. A basic advantage of common-emitter amplifiers is that their power gain is greater by a factor of several thousand than that of common-base amplifiers. Common-base amplifiers, however, have better operational stability, are less sensitive to temperature variations and to replacement of transistors, and contribute very little nonlinear distortion; such stages are used chiefly as final stages of high-power amplifiers. In its basic parameters the field-effect transistor closely resembles the tubes used in vacuum-tube amplifiers. These parameters include the slope of the characteristics, the input impedance, and the pinch-off voltage. (In the way in which its electrodes are used the vacuum tube is analogous not only to the field-effect transistor but also to the bipolar transistor: the cathode corresponds to the source and emitter, the grid to the gate and base, and the plate to the drain and collector.) The results of studies made on common-cathode, common-grid, or common-plate vacuum-tube amplifiers can thus be applied to the corresponding field-effect transistor amplifiers. permit the frequency-response curve to approximate the ideal, rectangular shape. The group of untuned amplifiers includes audio amplifiers, video amplifiers, and pulse amplifiers. Practical examples. The intermediate-frequency amplifiers used in some types of radio receivers contain several stages with two-circuit (Figure 3) or even more complex filters. In other types the intermediate-frequency amplifier may be an untuned amplifier with highly selective systems in the input and output circuits. Radio-frequency vacuum-tube amplifiers are frequently used in high-power radio transmitter equipment. The transmitting antenna represents the load of the final stage of such an amplifier (Figure 4); the antenna is usually connected to the amplifier by a transmission line. In transistor amplifiers used in multichannel communication systems the bandwidth depends on the number of telephone channels. For 300 channels the width is between 60 and 1,300 kilohertz; for 1,920 channels the upper limit approaches 9 megahertz (MHz); and for 10,800 channels the upper limit is close to 60 MHz. For example, an amplifier for 300 channels (Figure 5) usually has three common-emitter stages and features strong mixed feedback (the feedback circuit has a series-parallel connection to the input and output). Such a feedback system makes it possible to obtain a sufficiently high output power and to satisfy the severe requirements placed on the permissible level of nonlinear distortion in long-distance telephone communication systems. Feedback can also be used to provide input and output impedances that do not depend on the amplifying properties of the stages; impedance values may be obtained that ensure matching with lines, such as coaxial cables, connected to the amplifier. Transistor T4, which is in a common-base configuration, is connected in series with the transistor T3 so as to form what is called a cascode amplifier stage. The cascode amplifier has a wide pass-band and improved linearity. The operational amplifier is used to perform such mathematical operations as summation, differentiation, and integration. A high-gain DC amplifier (KU may reach 105), it is usually constructed as an integrated circuit (seeMICROELECTRONICS). When combined with external elements forming a feedback circuit, operational amplifiers are sometimes called computing amplifiers; such amplifiers are used in computer technology. The operational amplifier shown in Figure 6 has a noninverting input, for which the polarity of the output signal is the same as that of the input signal, and an inverting input, for which the polarity of the output signal is the opposite of that of the input signal. The first stage of the amplifier is thus a differential amplifier, which responds to the difference between the input voltages; as a result, signals of opposite polarity are added, and signals of the same polarity are subtracted and (because of the very high KU) have almost no effect on the output signal. The inverting input is generally used also to provide negative or frequency-dependent feedback. phase relationship. 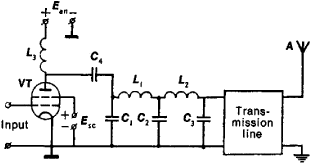 If the push-pull amplifier stage consists of active elements of the same type, such as p-n-p transistors, excitation is provided either by a phase-inverting penultimate stage (phase inverter) or by a transformer with a center-tapped secondary winding (Figure 7). If the push-pull stage contains active elements of different types, such as the complementary p-n-p and n-p-n transistors, it is driven by a source of single-phase voltage, that is, by a conventional, single-ended amplifier stage; in this case a transformer is not required. By comparison with a single-ended stage, a push-pull stage can provide a higher output power and lower nonlinear distortion. Transistor audio amplifiers without transformers are widely used. With single complementary transistors the output power can reach 1 watt; with compound-connected transistors (Darlington amplifier) the output power can exceed several tens of watts. Because of the absence of transformers, such amplifiers can be made in the form of semiconductor or hybrid integrated circuits. High-power vacuum-tube amplifiers are used in wire broadcasting subsystems and in radio transmitters as a modulating device. Such amplifiers usually have four push-pull stages and make use of relatively strong negative feedback to reduce nonlinear distortion and output background noise and to obtain a low input impedance. Lur’e, B Ia. Proektirovanie tranzistornykh usilitelei s glubokoi obratnoisviaz’iu. Moscow, 1965. Kalikhman, S. G., and Ia. M. Levin. Osnovy teorii rascheta radioveshchatel’nykh priemnikov na poluprovodnikovykh priborakh. Moscow, 1969. Tsykin, G. S. Usilitel’nye ustroistva. Moscow, 1971. Voishvillo, G. V. Usilitel’nye ustroistva. Moscow, 1975.
in engineering, a device that increases the power level of an input (controlling) signal by drawing on power supplied by an auxiliary (controlled) source. 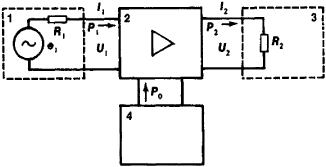 In contrast to converters, an amplifier exhibits a continuous and single-valued relation between its input and output signals. Amplifiers can be classified by the nature of the energy of the controlling signal and controlled source into electric, magnetic, hydraulic, pneumatic, and mechanical types. The amplifier is one of the basic components of devices used in automation, remote control, computer technology, measurement technology, radio electronics, and communications. Amplifiers are used in machine drives in electric power engineering, machine building, and transportation. A device capable of increasing the magnitude or power level of a physical quantity, such as an electric current or a hydraulic mechanical force, that is varying with time, without distorting the wave shape of the quantity. The operation of an amplifier can be explained with a model (see illustration). A controlled voltage source of gain K generates an output voltage Vo = KVi from an input voltage Vi. This input voltage is obtained from a source voltage VS with source resistance RS via voltage division with the amplifier's input impedance zi. The load voltage VL across the load impedance ZL is obtained from Vo by voltage division with the amplifier's output impedance zo. The input voltage and load voltage are given by Eqs. (1), where ki and ko, respectively, express the effects of the amplifier loading the source and of the load impedance loading the amplifier. The impedances zi and zo mostly consist of a resistor in parallel with a capacitor; often they may be assumed to be purely resistive: zi = ri and zo = ro. From Eq. 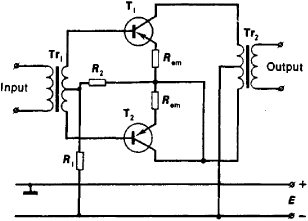 (1), the amplifier's operation is given by Eq. (2). The transconductance amplifier has become widely used. In contrast to operational amplifiers, which convert an input voltage to an output voltage, transconductors are voltage-to-current converters described by the transconductance parameter gm, which satisfies Eq. (3). Thus, the output current Iout is proportional to the input voltage Vin. As do operational amplifiers, ideal transconductors have an infinite input resistance, but they also have an infinite output resistance so that the output is an ideal current source. One of the attractive properties of transconductance amplifiers is their wide bandwidth. Very simple transconductance circuits can be designed which maintain their nominal gm values over bandwidths of several hundred megahertz, whereas operational amplifiers often have high gain only over a frequency range of less than 100 Hz, after which the gain falls off rapidly. Consequently, in high-frequency communications applications, circuits built with transconductance amplifiers generally give much better performance than those with operational amplifiers. Typically, amplifiers increase the power or signal levels from low-power sources, such as microphones, strain gages, magnetic disks, or antennas. After the small signals have been amplified, the amplifier's output stage must deliver the amplified signal efficiently, with minimal loss, and with no distortion to a load, such as a loudspeaker. 2. such a device used for the amplification of audio frequency signals in a radio, etc. A device that accepts a small signal and outputs a larger signal that generally matches the waveform characteristics of the input. Amplifiers are available to boost electrical and optical signals. See amplifier classes, Class D amplifier and PWM. For high gain operational amplifiers, the transfer function in Eq. The record-breaking amplifier, fabricated in a high-performance semiconductor material known as indium phosphide (InP), achieved an output power density of 360 milliwatts per square millimeter at 23 GHz. D2Audio, Intelligent Digital Amplifiers, DAE, the D2Audio logo and the other trademarks named on the D2Audio website are trademarks of D2Audio. All the new Reference Series amplifiers include built-in variable electronic crossovers with 12dB/octave slopes for precise control of the audio signal. A Designer's Guide to Instrumentation Amplifiers -3rd Edition is available free on the ADI web site and in hard copy. At the heart of the DHS A Series amplifier lays an advanced D2Audio Digital Audio Engine[TM] (DAE-1) Class-D PWM controller with an integrated DSP. These two new QLight[TM] amplifiers address the needs of the next generation of networks by expanding the limits of current GPON, EPON and BPON architectures. The internal feedback resistors of the MCP6G0x amplifiers are laid out in consideration of thermal gradient issues to reduce gain error over temperature. According to Rick Beale, JamTech vice president of marketing and business development, "The JM2020 sets a new performance bar for digital audio amplifiers. It is a further milestone in our roadmap to make this product line the standard for Raman amplifiers. Traditional Class D and digital amplifiers typically have a spectral noise floor between 100-105 dBFS, making it impossible to discern low level audio from the noise.